I've been reading quite a lot of graphic novels lately. Some are from NetGalley, others from the library. I will be doing a few posts on the graphic novels over the next few weeks - I'm still deciding how I want to do them. I don't have a whole lot to say about some of the books, so I may do either mini-reviews or combined posts. But there is this one book - Lucille by Ludovic Debeurme - that I have a lot to talk about, and so I'm kicking off the graphic novel review spree with this. Teenager Lucille is having identity issues. 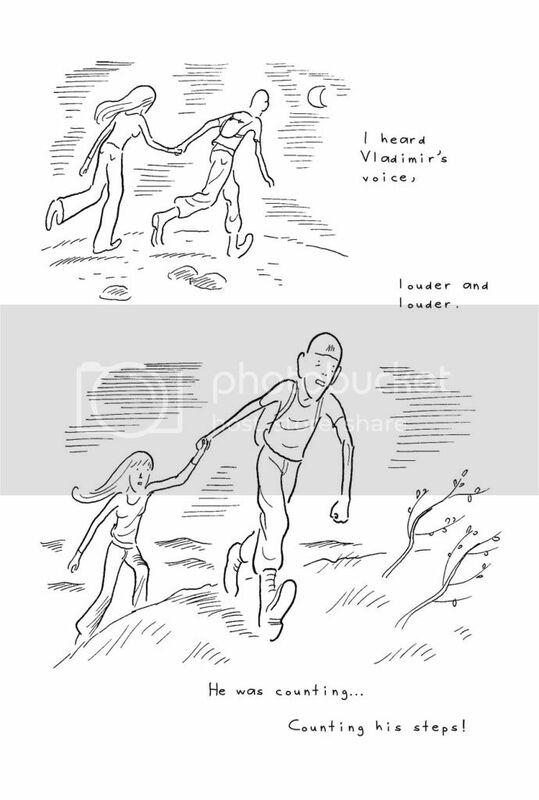 The book starts off with her addressing her sexual needs and looking at her thin stalk-like body in vain. The boy she is interested in has jumped out of her research team to work with a girl he likes. She is worried that no one will like her, and her mother isn't too helpful when Lucille asks her about it, saying that Lucille's looks doesn't matter since she has brains. 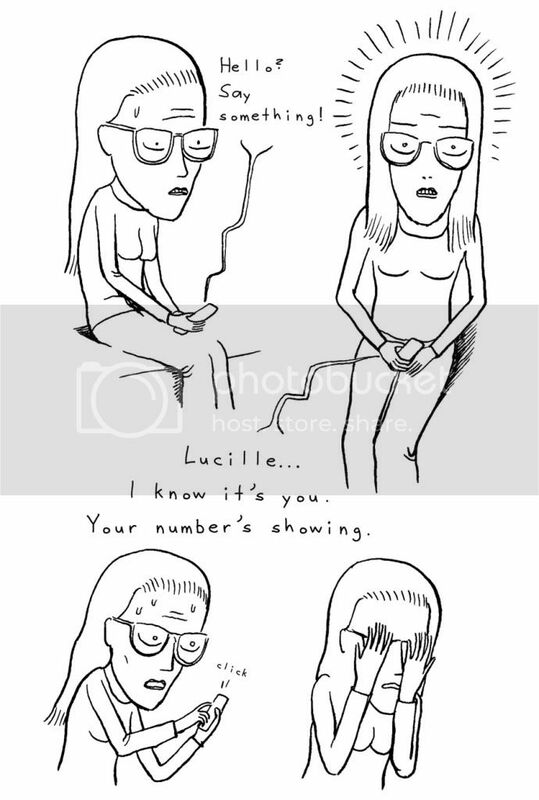 Lucille's identity issues soon escalate sending her into a spiraling abyss of anorexia. However, even after she is discharged from hospital care, she is still obsessed with losing weight, and is too weak to even move much. Lucille, the book, introduces another character - Arthur, who I feel is the more important character of the book. Arthur has extreme OCD; he keeps counting - counting steps, counting slabs, counting just about anything. His father has severe alcoholism and rage problems, which often result in bar fights. After one such bar fight in Arthur's presence makes Arthur disfigure the face of an influential man, his father finds difficulties finding a new job, having just been laid off his previous one. Arthur also inherits his father's temper. Both kids - Arthur and Lucille - have issues, stemming from certain lonesome experiences as kids. As teenagers, they both struggle to fit into society and develop anorexia/OCD as a means to combat with their loneliness and low self-esteem issues. Lucille and Arthur eventually meet up, and the story afterwards is as rich as the one before. Two people with issues don't always complement each other. Their destructive traits can bring the other person down. I was impressed with how the author played their dynamic relationship. This is a love story and yet not one either. It's about two misfits who find each other and relate with each other's weaknesses. They find comfort in the fact that they can be themselves with each other and not pretend to be someone else. And yet with that acceptance of each other, they also dawdle in their own obsessions and find it hard to overcome them. I found this a very moving story and it is a testimony to Ludovic's brilliant graphics that I found my emotions spanning a whole gamut as I followed the characters' lives. If I had one issue with this book, it was how their first meeting was handled. I thought it appeared a bit cheesy and unbelievable. Ludovic uses very clean drawing that removes away any clutter in the picture. There's only the necessary amount of detail in it - nothing more, nothing less. And that allows the reader to feel the loneliness of the characters and their anguish in certain circumstances. Most of the focus is on the characters of the book. Their expressions, even when stripped of all emotions, tell a lot. Lucille is not told in a linear fashion, and we learn some things early and some later. This works well for the story because the author doesn't waste time and pages in dragging out a moment but the aftermath of the moments can still be felt. In addition to letting his pictures capture the raw emotions of the characters, he also uses dreams and internal dialogues to exhibit their restless minds. Both Lucille and Arthur dream of flying away from their problems. This book deals with anorexia, alcoholism, dysfunctional relationships and OCD in a very delicate manner. Although that's a lot of issues, it doesn't feel like too much, because the graphic medium easily laps it up. Those who loved Blankets by Craig Thompson and Stitches by David Small will enjoy this one. Lucille shares the very expressive anguish of Blankets and the uncluttered, simple and articulate drawings of Stitches. The French original of Lucille has already won a lot of awards. At 545 pages, this is a huge book, but I finished it in an hour and a half. And it's just part one, so it ends with a lot of questions. The part two, Renée, has already been published in French, and will be published in English next year. The publisher, Top Shelf Productions, is soon becoming a favorite of mine. They had published Blankets, which I absolutely loved, and also Essex County, which I can't wait to read. And I just finished another new one by them which I enjoyed. I received this book for free for review from the publisher, Top Shelf Productions via NetGalley. Lucille was originally published in French in 2006. It's English translation made its debut on July 12, 2011. That is a lot of issues discussed in a graphic novel! Sounds fascinating, I think I should request this one as well! I have never read a graphic novel, and I don't know why, but I never thought a graphic novel could deal with so many issues. I think I will try some, maybe request this from Netgalley. I was thinking that's a lot of issues to tackle in one book, but it sounds like he does it well. This does sound as if it's a very emotionally complex read, and the graphics you've shown seem to illustrate that beautifully. I am not much of a reader of graphic novels, but sometimes something comes along and makes me rethink that. This book is one of those. Thanks for the very erudite and thoughtful review. I really enjoyed it, and you've enticed me into adding this book to my wish list! i've only read one graphic novel. i know, i know, i'm a bad reader. what can i say? as a kid, i was just never into comics or the like and today i still struggle with the graphic novel format. my husband, on the other hand, is a fiend for them. but, i wanted to ask how you find reading graphics either on your computer or a kindle (via net galley)? is it more difficult than with a paper format? I still have yet to read a graphic novel. This one seems quite lovely, especially dealing with such delicate topics. I've never read a graphic novel before. Just like Booklineandsinker, I'd probably struggle with the format too. Very interesting review though. I read this one on my computer (instead of an ereader). For one thing, I hate graphics on ereaders, I feel the devices are best suited for text than pictures, which can look dry and boring. On my computer, it wasn't hard to read. I can't read books on the pc for long, but the graphic format works well here.